Responsive Web Design (RWD) is a device-independent UI (user interface) design philosophy that aims to develop and deliver an optimized experience on devices with different widths and resolutions: PC, notebook, tablet, smart phone, etc.We at OdiTek Solutions plan, design, and develop innovative responsive websites that promise high conversion rates and traffic. Our talented team of responsive web developers creates customized responsive website design which caters to your unique requirements. These websites, created by us, adapt the site layout to the viewing environment. This delivers unique experience to different customers who are using different devices to view a website. Dynamically resizing the content and imagery of a website, it makes the viewer get the best viewing experience irrespective of the device used to browse the site. 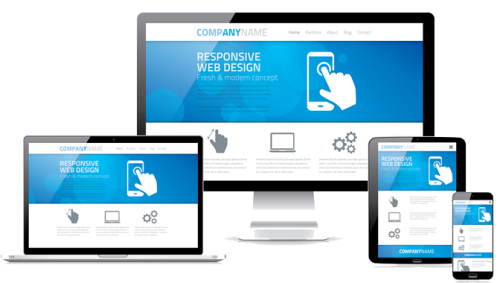 We deliver professional responsive website design that depicts your business values apply. OdiTek Solutions provides its dexterous services to help you not only to deliver a touching experience to existing customers but also to help your business gain more clients. The following are some of the benefits that you can gain through stunning responsive website designs created by the experienced team of developers at OdiTek Solutions. At Oditek our experts have laready worked on many skills ( listed below) to develop the best responsive website for our customer. We are using both type (i.e-Front end and Backend) frameworks to make a website full responsive.The list of frameworks are listed below. The tools and techniques that come under the banner of responsive web design have always been staples of the development community—and will continue to thrive as the practice of RWD breathes new life into them. The pillars of RWD provide a set of techniques that can be applied singularly or collectively to help position your users as the application’s focus. Fortunately, we designers and developers are an innovative, caring, and sharing lot. We like to ease each other’s pain. Along with the growing need for responsive websites, there’s been a parallel growth of tools to help make responsive web design and development just a little bit easier. I’ve sorted through some of the tools available and put together this list to help through the phases of the responsive design and development process. Note that this is by no means an exhaustive list.